This is a standard 20mm TSOP48 16 bit adapter set for Willem programmers. It is for both True-USB Willem programmer and all parallel Willem Programmers. 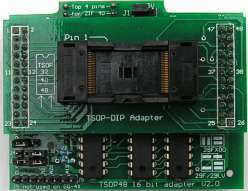 It includes one TSOP48 professional ZIF socket boad, one 16 bit TSOP48 base board and address jumper wires. This adapter consists of ADP-077 top module and ADP-073 base module.